Trying to get in an exercise routine? The secret may be in becoming an early bird; 90% of people who exercise consistently have a morning exercise routine. Working out in the morning also boosts your energy, increases mental sharpness, and jumpstarts your metabolism for the day. Exercising early sets a tone of positivity and productivity for the rest of the day. Still, we know that very few people love the morning hours, so we’ve put together some tips and tricks to get you up and moving every morning. Getting up earlier is much more pleasant if you go to bed at a reasonable hour. If possible, crawl into bed thirty minutes before you actually want to be asleep. Read a book or journal a bit to unwind the mind until you drift off naturally. Just make sure you set your alarm first! There are lots of tools out there to help you make your alarm clock smarter. 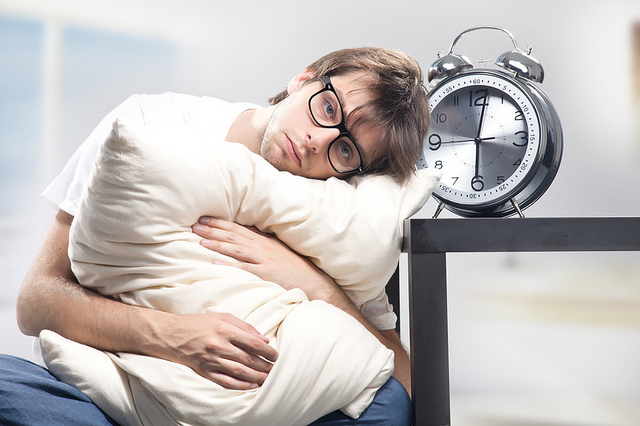 Make your alarm clock setting habits more efficient with sleepytime. Just put in when you’re going to bed and the site will calculate what time you should set your alarm for so that it will be most likely to wake you up at the ideal point in your sleep cycle. If you’re not creeped out by your phone spying on you in your sleep, download an amazing app, like SleepTime, that uses the motion sensing technology in your smart phone to sense your motion patterns as you sleep. The app uses these patterns to detect when you’re in the optimum point in your sleep cycle to arise without grogginess, and wakes you up at that point in the cycle closest to your desired wake-up time. A little hydration in the morning is and instant rejuvenating kick. Place a bottle of water by your bed before you go to sleep, and down it as soon as you turn off your alarm. Wearing your workout clothes as pajamas means you’re already halfway there when you wake-up – plus you have a reminder first thing for the excellent reason you have to get out of bed. Set up other necessities as well – have your running shoes by the door, your yoga mat rolled out, or your gym bag all set up. With your gear staring at you, ready to go, you’ll have a hard time looking it in the eye if you ditch your fitness routine. Having a workout buddy is a great way to stay on track, so make a date with a friend for an early morning jog or to hit that 6 am yoga class. If you have someone else you’re responsible to, you’re a lot less likely to bail. Even if you’re someone who prefers working out alone, a text buddy can be a great motivation. Shoot each other a good morning text each day, and even if they never see you get moving, you’ll feel held accountable. Don’t make morning exercise another way to rush your morning. If your morning workout is accompanied by leisurely you-time, you’ll start loving the quiet hours of around dawn before you know it. While it seems counterintuitive to wake up even earlier to start loving waking up earlier, give yourself an extra 30 minutes to drink a cup of tea or coffee and linger over the newspaper, Facebook, a real book, or your own thoughts. It’ll make the mornings feel leisurely and luxurious – not like an obligation you must face. You will not get a workout in later. You will not do extra tomorrow. Now is the only time you have. Stick to that line, and you’re a lot less likely to talk yourself out of doing it. It’s a lot harder to say to yourself “I’m just not going to workout today,” then to rationalize your way out. At the same time, don’t make it all or nothing. Commit to 10 minutes a day, and you’ll probably find yourself well exceeding that most days. And for the days you don’t – you still did 10 minutes.